ChipCure latex wood putty works great on scratches, chips, dings and dents in floors, furniture and countertops. This easy to use furniture repair putty applies smooth, and isn't sandy or sticky. The laminate floor scratch filler dries hard, but will flex with an expanding and contracting floor. 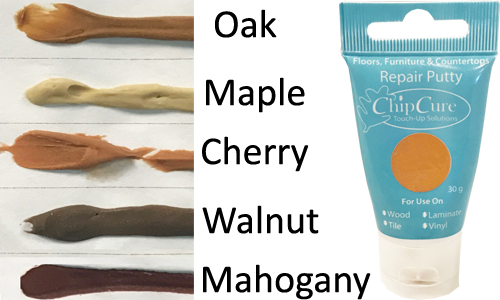 With five colors available, you will find a match to your wood, tile, laminate, or vinyl surfaces. You can even mix multiple colors together to get the overall color you need. The Cal-Flor ChipCure repair putty is sold in a 30 gram container. Fix the imperfections in your furniture or flooring with the affordable ChipCure wood putty. We carry a full line of repair products, including carpet repair and squeaky floor repair.